This archive article was originally published in the Anniversary 2016 issue of Antiques & Fine Art magazine. As the sun broke through the rain-soaked clouds and spread across the rooftops, I knew we had reached our destination. It was late May in Brazil. Having spent a week in the hilly interior of Minas Gerais, we now crossed the humid plains of Bahía in eastern Brazil seeking the remote Jesuit seminary of Belém de Cachoeira. The seminary was established by the globe-trotting Jesuits in 1686 when they came to found a school and church in the region. A small town grew around the complex. Then time froze. Fig. 1: Ceramic shards from the roof of Jesuit Seminary of Belém de Cachoeira, Brazil. Earthenware with underglaze blue decoration, Staffordshire, England, 1840–1860. Photography by the author. Fig. 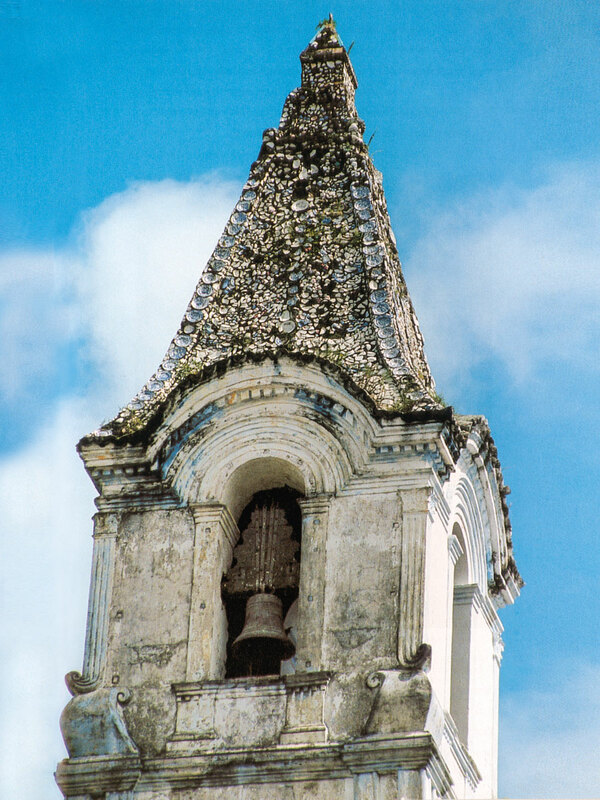 2: Church of Nossa Senhora da Conceição do Monte, with steeple encrusted with Chinese porcelains, Cachoeira, Brazil, 18th century. Photography by Gauvin Alexander Bailey. My traveling companion was Christine Thomson, a furniture conservator and paint specialist who had come with me from Boston. 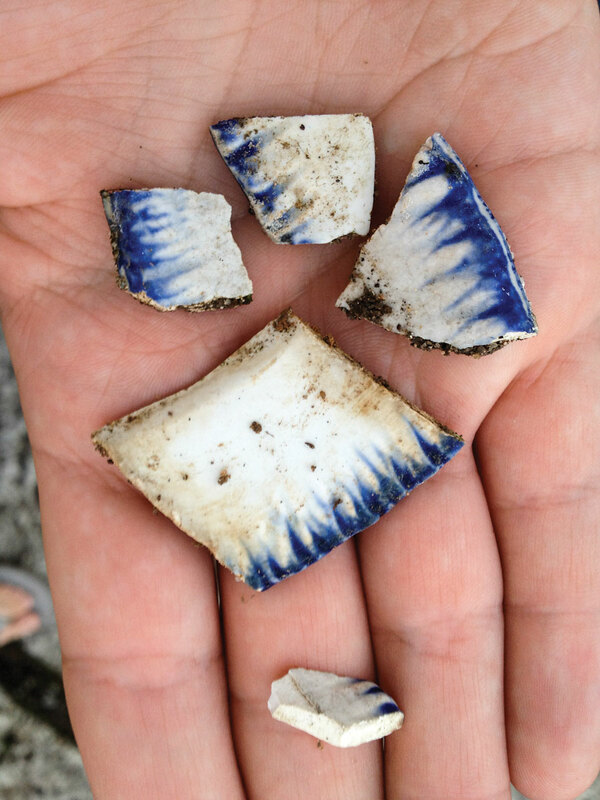 As we stood in front of the church, Christine looked down at the ground and noticed the glint of small white and blue ceramic shards half buried in the still-damp earth. The shards were unmistakably English earthenware, with their characteristic white bodies and molded edges, decorated with a feathered band of underglaze blue (Fig. 1). English pottery of this general type was exported throughout the world in the late eighteenth and nineteenth centuries, yet the thought of it reaching this remote village in colonial Brazil was surprising. Still more amazing was the source of these shards. Looking high up at the steeple, which now gleamed in the late afternoon sunlight, entire plates of this British crockery were still visible, some of which had over time broken loose and cascaded down. The use of ceramic plates and tiles for decorative roofing material in Brazil is not unheard of—in fact, there is a name for it in Portuguese, embrechado. These were probably not the first plates on the roof; the originals may have been Chinese blue-and-white export porcelain, as are seen on other rooftops in Brazil (Fig. 2). 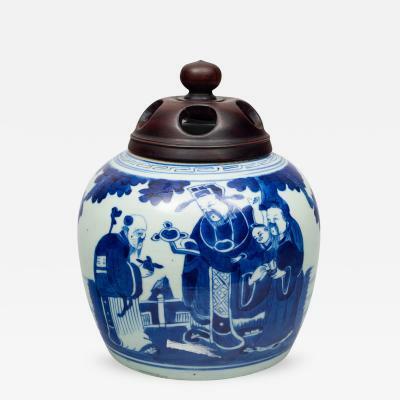 Chinese porcelain became so popular, and prevalent, as part of the Portuguese trade via Macau, China, that by the eighteenth century, it evidently became useful as roofing material. This says everything about colonial Brazil’s position within the global trade networks that developed in the sixteenth century, connecting Asia with the colonial Americas. Fig. 3: Sacristy ceiling, Church of Belém de Cachoeira, Charles de Belleville (1656–1703), Brazil, 1700–1710. Photography by Christine Thomson. Fig. 4: Detail of figure 3. Photography by Christine Thomson. We had come to Brazil on a research grant from the National Endowment for the Humanities while I was preparing the exhibition, Made in the Americas: The New World Discovers Asia, which was on view at the Museum of Fine Arts, Boston, and Winterthur Museum in 2015-17. More specifically, we had come in search of a type of painted decoration called “japanning,” or its unique counterpart in colonial Brazil, which simulates the glossy sheen of decorated Asian lacquer work using European painting techniques and materials. Fig. 5: Chapel of Nossa Senhora do Ó, Sabará, Brazil, about 1718. Photograph courtesy Günter Heil. Japanning is well known in eighteenth-century Boston decorative arts, but it was also done in other areas of the British colonies, including Jamaica, and in Mexico, Guatemala, and Brazil, where it graced both church interiors and luxury objects like furniture for fine domestic interiors. The reason for our visit to Belém de Cachoeira was the painted ceiling of the sacristy of the church, which was executed by the remarkable French Jesuit, Charles de Belleville (1656–1730) (Figs. 3, 4). De Belleville spent nine years working in the imperial court in China. On his way back to Europe in 1707, having fallen ill on the Portuguese ship that was transporting him, he was dropped off in Brazil. His two-year leave of absence turned into a more than twenty-year sojourn, during which he continued to work as a painter. De Belleville’s artistic influence in Brazil is still being investigated, with the ceiling of Belém de Cachoeira being the only surviving work attributed to him. 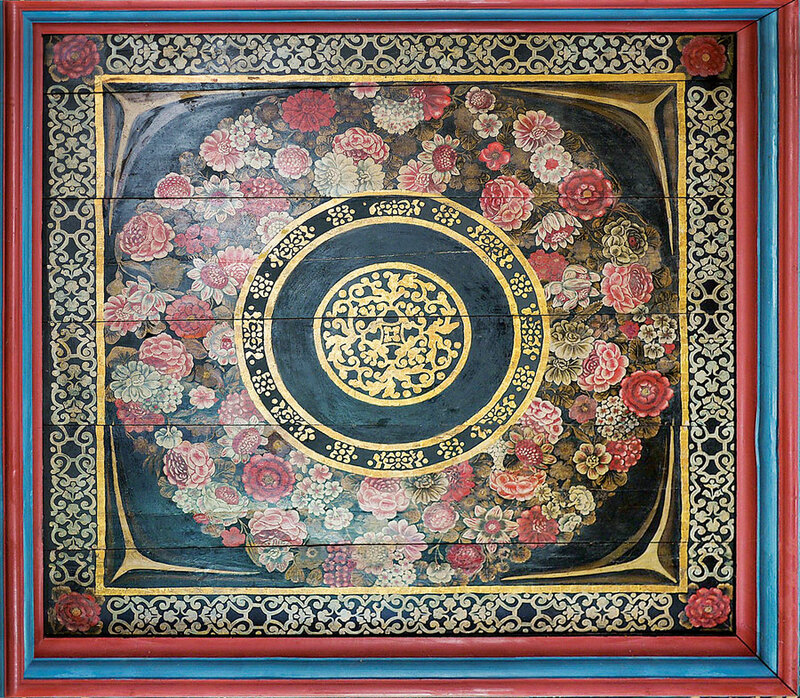 Scholar Gauvin Bailey has called it “the most authentically Asian-style artwork made in South America.” 1 Set on a black background, like lacquer work, and encrusted with brightly painted peonies, lilacs, and even the native Brazilian passionflower (mburucuyá), the ceiling recalls Chinese screen and decorative painting. Having fallen into disrepair, it has been recently restored by the Brazilian government. Within a decade of De Belleville’s work, another style of painting, one less directly Chinese and more influenced by “japanning” in Europe, began to appear in colonial Brazil. 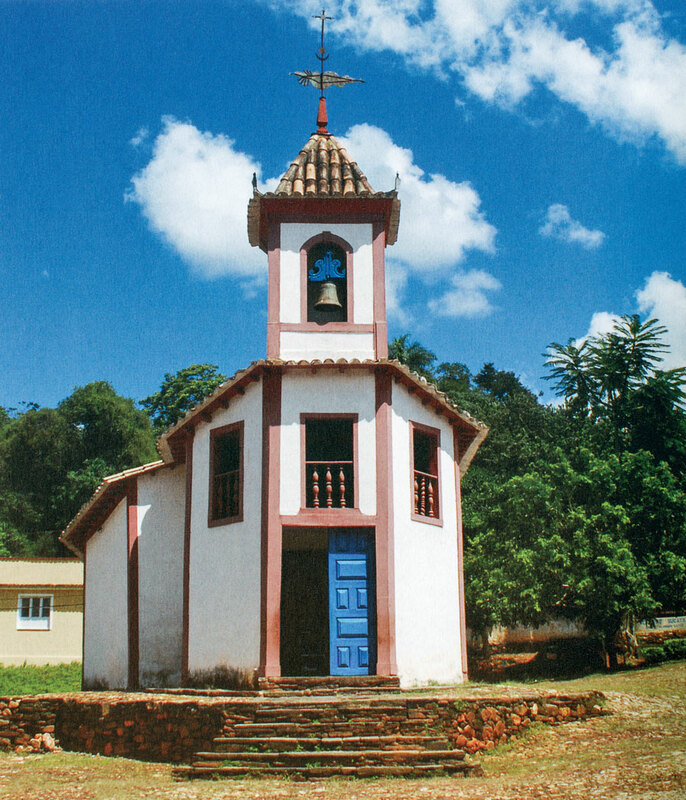 The earliest example is thought to be the circa 1718 chapel of Nossa Senhora do Ó in Sabará in Minas Gerais (Fig. 5). 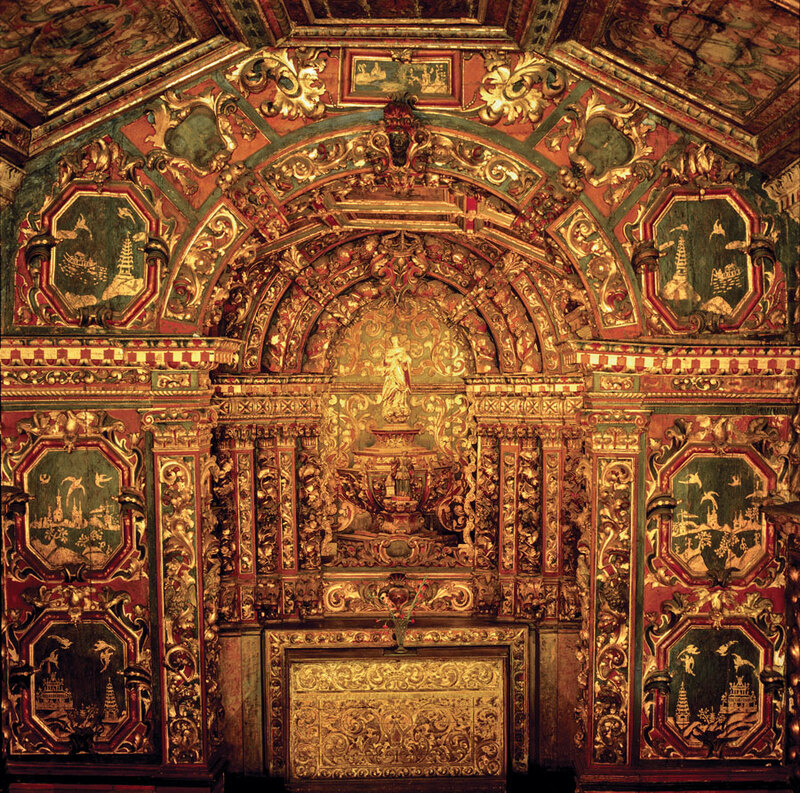 The tiny size of the chapel hardly prepares the viewer for its elaborate baroque interior—carved, painted, gilded, and set with seven chinoiserie paintings in gold on a dark background (Fig. 6). Once thought to have been painted by an artist from Portuguese Macau, the style of the painting is unmistakably European-style chinoiserie. This fanciful vocabulary emulates Chinese decorative elements and includes items seen here such as pagodas, fishing boats, and birds flying above an Asian coastline; it is the decorative manner typically used with japanning. Christine told me that what looks like a black background today was most likely originally dark blue, perhaps Prussian blue, an iron-based deep blue pigment that was developed in Europe around 1708. Chats with friendly locals led us to the church of Nossa Senhora da Conceição, which has two chancel doors painted with japanned or chinoiserie decoration. One door appears to have been painted by an artist trained in Europe, given the quality and technique of the painting, while the other looks to be a later copy executed by a less-skilled artist. Clearly we were seeing something of a phenomenon in Minas Gerais, a fashion for Asian style developing in remote mountain towns at the same time it was becoming fashionable in Europe and Boston. Fig. 6: Interior of Nossa Senhora do Ó, Sabará, Brazil, about 1718. Photograph courtesy Günter Heil. Fig. 7: Choir seats, Cathedral of Nossa Senhora da Assunção, Mariana, Brazil, after 1753. Photograph courtesy Günter Heil. Next we were off to the cathedral in Mariana, which has by far the largest group of chinoiserie paintings in any church in the region—twenty tall choir stalls lining the walls leading up to the altar. Painted in gold and silver on a Chinese red background, they illustrate cavorting figures, fanciful architecture perched impossibly on irregular outcroppings of rock, and birds playfully twisting in the air (Fig. 7). 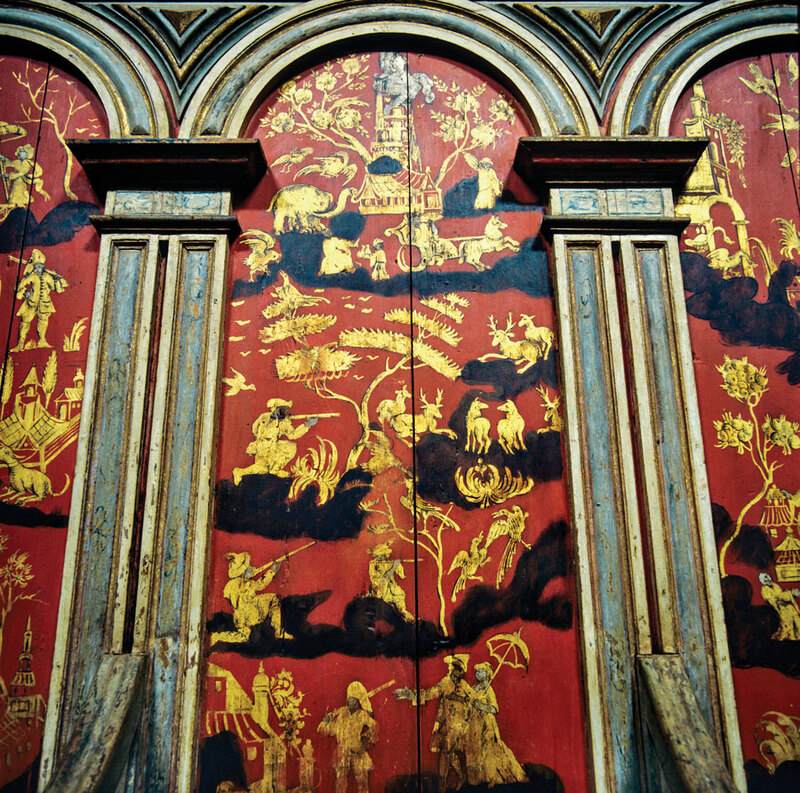 This painting was likely inspired by the cathedral’s Hamburg-built Arp Schnitger organ, with its red and blue chinoiserie-decorated case, which was a gift to the church by the Portuguese Crown sometime after 1753. In Brazil we had witnessed the influence of imported European objects as well as the work of European- (and Chinese-) trained craftsmen, and the effect that it had on local painting styles. The same phenomenon can be seen in colonial Boston, and other areas of the British colonies, such as Port Royal, Jamaica, where European-trained “japanners” and decorative painters had come to work by the second decade of the eighteenth century. The style was also promulgated by European artists’ manuals on japanning, such as John Stalker and George Parker’s Treatise of Japanning and Varnishing (1688) and the Italian Jesuit Filippo Bonanni’s Tratado sopra la vernice (1720). Fig. 8: High chest, John Pimm (active by 1735, died in 1773), Boston, 1730–1739, japanning attributed to Robert Davis (died in 1739). Soft maple, white pine, mahogany, with japanned decoration. H. 85¼, W. 42, D. 25-1/4 in. Winterthur Museum; Gift of Henry Francis du Pont (1957.1084). Fig. 9: Replica japanned drawer front, Christine Thomson, Salem, Mass., 2015. Japanned decoration on maple. Museum of Fine Arts, Boston. Photography by Christine Thomson. 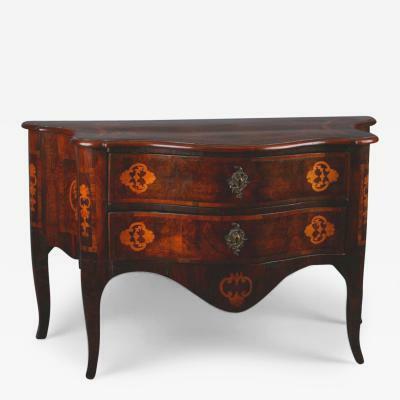 One japanner, Robert Davis, from London, has recently been credited with decorating the extraordinary japanned high chest made by Boston furniture maker John Pimm probably sometime in the 1730s (Fig. 8), now owned by the Winterthur Museum.2 He had moved from London to Boston, where he married the daughter of another Boston japanner, his business partner William Randle. Davis is also responsible for japanning the recently discovered high chest that sold at a Skinner auction in 2004 for a record $1.9 million and bears his handwritten signature. 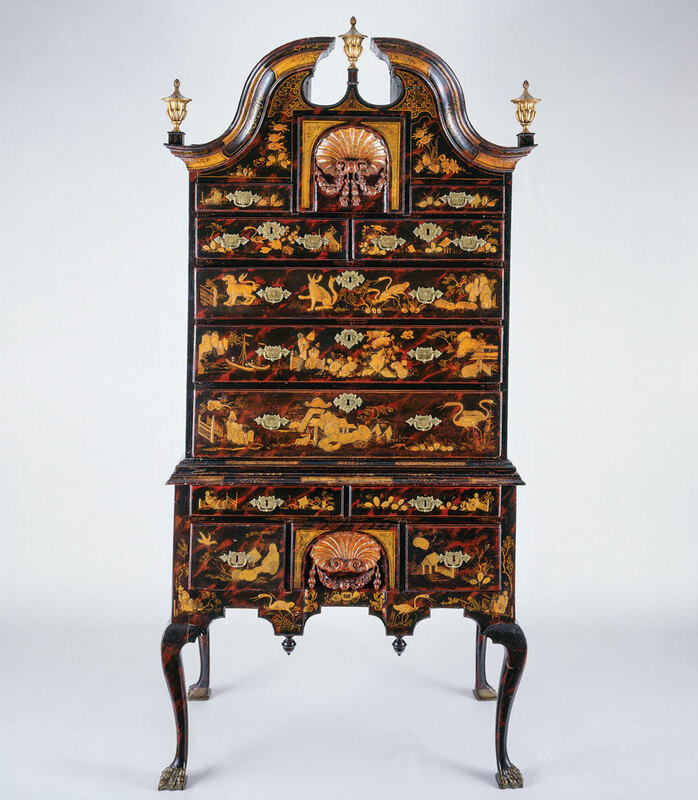 For the Made in the Americas exhibition, we asked Christine to make a replica of the upper long drawer of the high chest from Winterthur, approximating what the japanned surface would have looked like originally, using Davis’ original materials and techniques. The results were spectacular, and unexpected (Fig. 9). This style of painting, if not the specific techniques, was also practiced in Mexico in the eighteenth century, particularly in the western state of Michoacán. The technique grew out of indigenous painting traditions of the pre-Hispanic period, which used a mixture of oils from chia seeds and aje, rendered from insects, combined with clays and pigments to create a shiny, colorful, and water-resistant resin often used to coat gourd cups. After the sixteenth century, once East Asian lacquer wares began arriving on the Spanish galleons across the Pacific, the medium morphed into something looking more like the imported lacquers, and began to be called maque (derived from the Japanese word for lacquer, maki-e) and laca (the Spanish word for lacquer). Fig. 10: Desk-on-stand, José Manuel de la Cerda (active mid-18th century), Pátzcuaro, Mexico, about 1760. 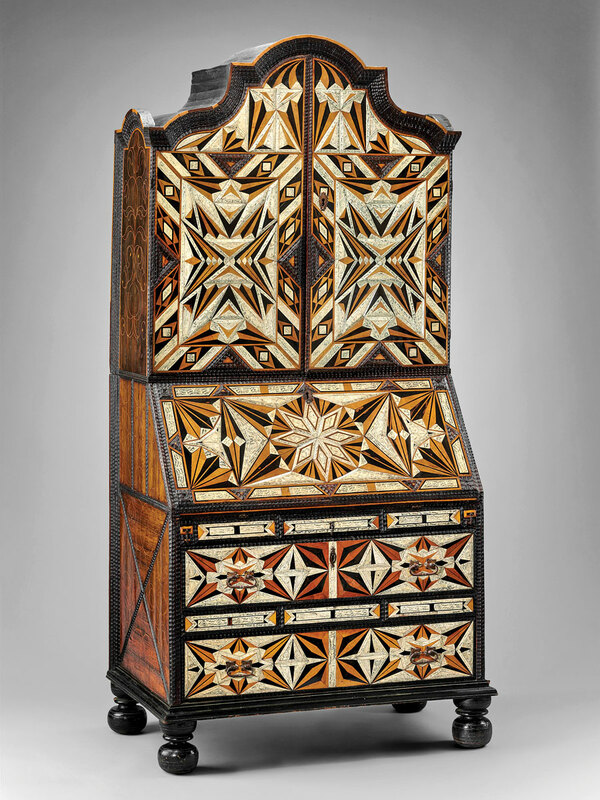 Linden wood with Mexican lacquer and polychrome decoration, Spanish cedar. H. 61, W. 40-3⁄16, D. 24 in. The Hispanic Society of America, New York (LS1642). Fig. 11: Detail of figure 10. In the town of Pátzcuaro, an indigenous artist of noble birth, José Manuel de la Cerda, created what are now the most famous of the locally produced painted wares. 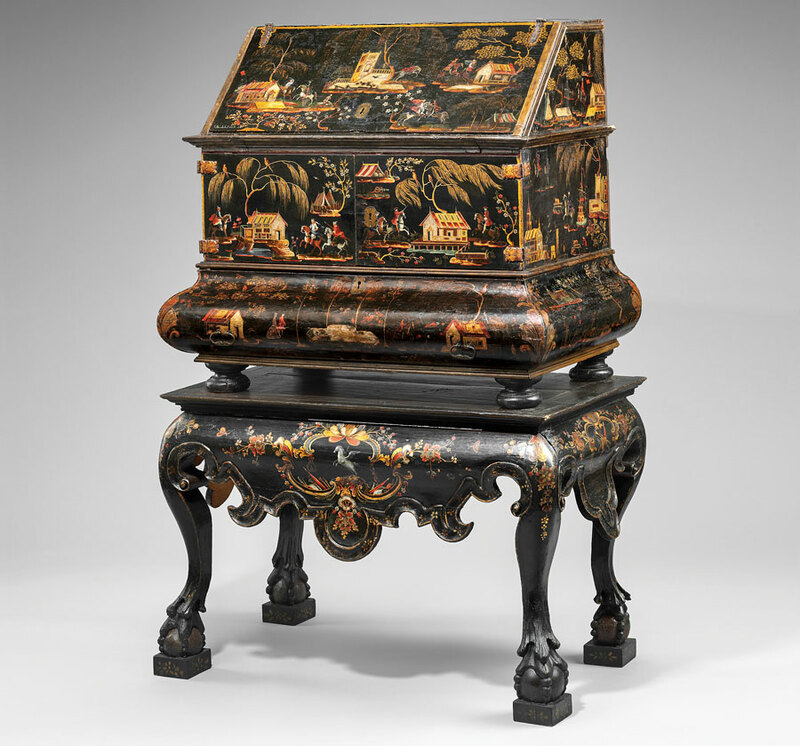 Many objects are attributed to de la Cerda, but he signed only two of his works, including a remarkable desk-on-stand (Figs. 10, 11), which is covered with weeping willow trees, exotic-looking buildings, and sabre-brandishing cavalrymen (both Christians and Moors) who gallop across its front doors on horseback. Although different in style and materials than japanning in Boston and elsewhere in the Americas, de la Cerda’s works show a similar artistic impulse and the desire to promulgate the popularity of the chinoiserie style imported from Europe to Mexico. 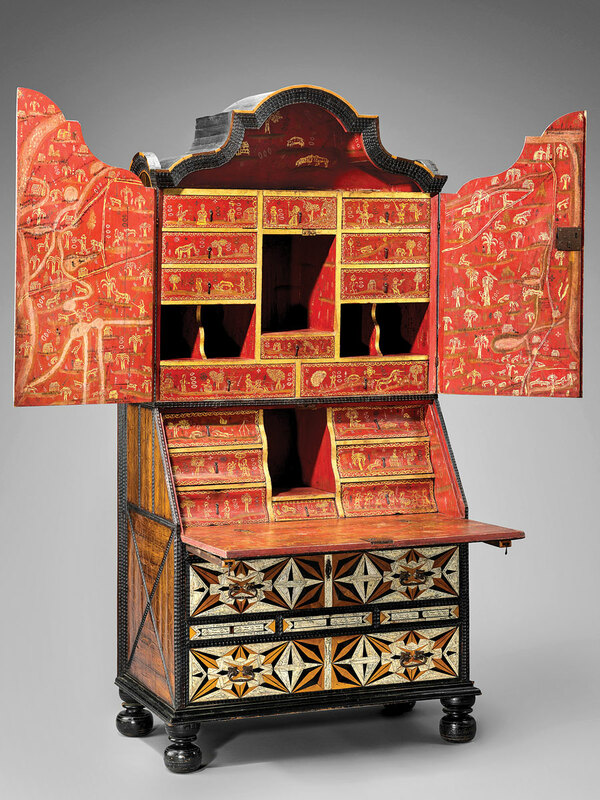 A similar hybridity can be found in one of the most interesting and dazzling viceregal Mexican objects known, a spectacular desk and bookcase recently acquired by the Museum of Fine Arts, Boston (Figs. 12, 13). The striking red interior is loaded with chinoiserie-style painting in gold on a bright red background. The door interiors show maps painted in an indigenous style, but combined with fantastical chinoiserie—blending Mexico, Asia, and Europe. The interior of the lower writing compartment is painted with a view of Mount Parnassus from classical literature, complete with representations of the muses, but set in a Mexican landscape with not one but two mountains—not Parnassus at all, but the twin volcanoes Popocatepetl and Iztaccihuatl that dominate the skyline of central Mexico. Fig. 12: Desk and bookcase, Puebla de los Ángeles, Mexico, about 1750. 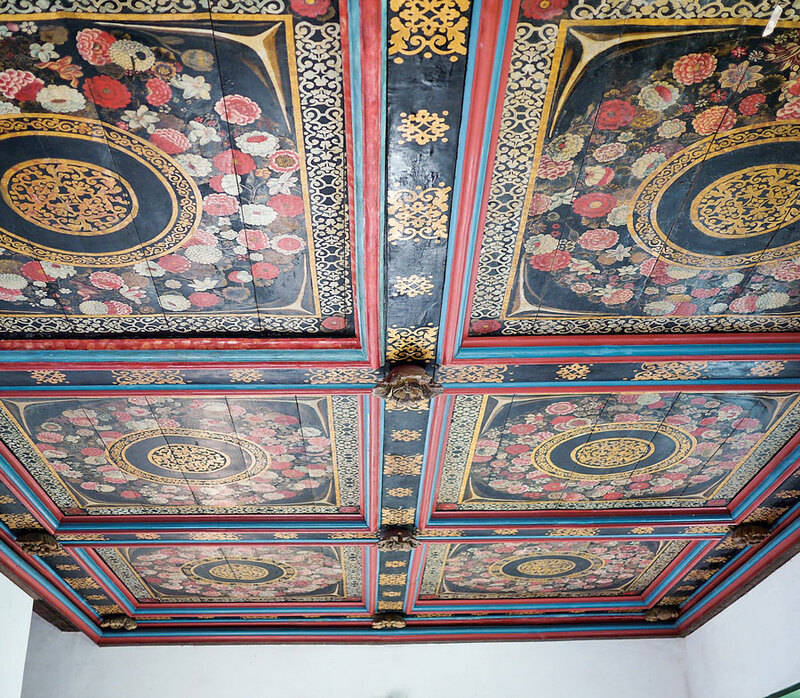 Inlaid woods and incised and painted bone, gold and polychrome paint, iron hardware. H. 87, W. 41, D. 26-1/2 in. Museum of Fine Arts, Boston; Oliver and Zoe Sherman Fund. Fig. 13: Desk shown in figure 12, open. As we crisscrossed the Brazilian landscape, Christine and I discovered more fusions between European and Asian styles that embodied the then new era of globalism. On the inside of the church of Belém de Cachoeira, conservators were only just beginning to remove layers of whitewash that covered the walls of the nave and altar. Only small sample patches had been opened at various places, yet, the barely visible foliage, flowers, and patterns took our breath away. Through these small windows, the world opened to us, the world of trade and artistic exchange that came to this church in the early eighteenth century. It was exhilarating to know that more discoveries await us in the future. 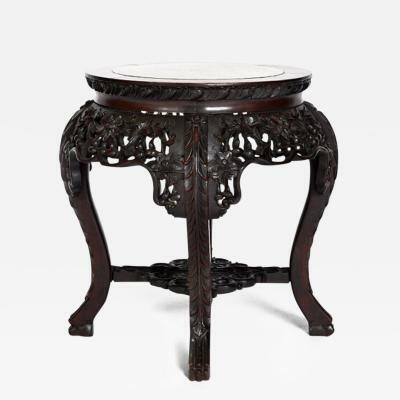 Made in the Americas: The New World Discovers Asia opened at the Museum of Fine Arts, Boston (August 18, 2015-February 15, 2016) and travelled to Winterthur Museum, Garden & Library, where it was on view from March 26- January 8, 2017. Dennis Carr is the Carolyn and Peter Lynch Curator of American Decorative Arts and Sculpture in Art of the Americas at the Museum of Fine Arts, Boston. The author kindly thanks Gauvin Alexander Bailey, Tara Cederholm, Mitchell Codding, Caroline Cole, Cecília Fortes, Rob Hunter, Christine Thomson, and Adriana Varejão. This article was originally published in the 2016 Anniversary issue of Antiques & Fine Art magazine, a fully digitized version of which is available at www.afamag.com. AFA is affiliated with Incollect. 1. See Gauvin Alexander Bailey, “Religious Orders and the Arts of Asia,” in Dennis Carr, et al., Made in the Americas: The New World Discovers Asia (Boston: MFA Publications), 105. 2. For this and other new discoveries about Davis, see Tara Hingston Cederholm and Christine Palmer Thomson, “‘Tortoiseshell and Gold:’ Robert Davis and the Art of Japanning in Eighteenth-Century Boston,” in Brock Jobe and Gerald W. R. Ward, eds., Boston Furniture, 1700–1900 (Boston: Colonial Society of Massachusetts, forthcoming).